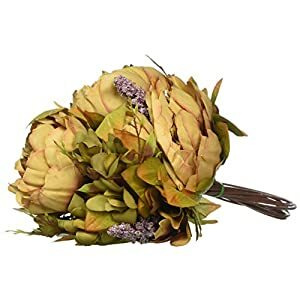 ALL SEASON FRESH DECORATIONS: Containing 7 different type of flowers with 3 pcs X Pineapple Grass totaling a number of 9 unpotted succulent plants, with sizes between 2.7″ and 15.7″, this faux greenery set is the perfect choice for creating the most amazing decorations, adding a touch of tropical feeling. You can use this succulent flowers individually or together for filling a medium size pot. HIGH-QUALITY REALISTIC LOOKING: This assortment of succulents is made only from the highest quality plastic and some with flocking coating, in order to give them the most realistic look possible. 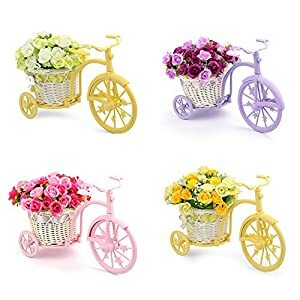 Each artificial plant has natural vivid colors, they are much lighter than real ones, maintaining their appearance for a longer time, offering you the possibility to enjoy fresh flowers throughout the whole year. LET YOUR CREATIVITY FREE: These faux cactus plants are an amazing choice for decorating homes, gardens, hotels, walls, offices, parties, receptions and even create special and modern arrangements for dream weddings. 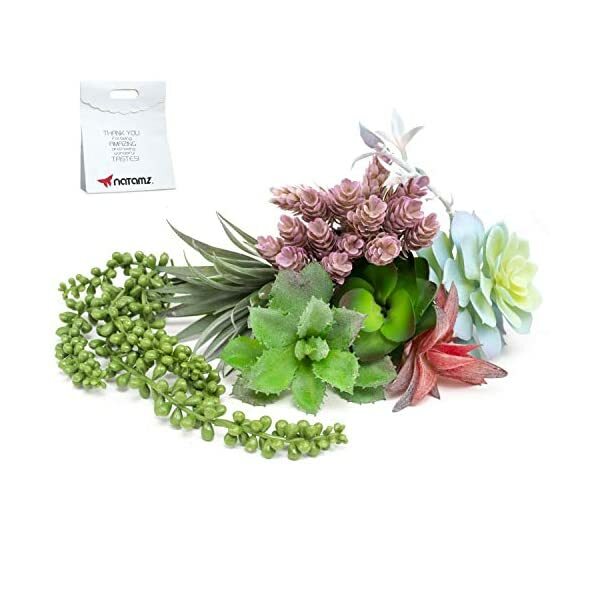 Surprise your plant lover friends with this colorful fake succulent flowers or create a special gift for your mother’s birthday, for new homeowners or any anniversary. 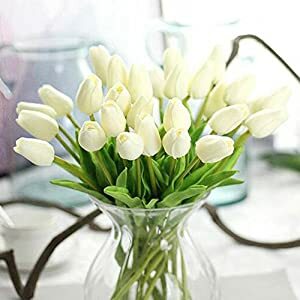 If you were in search of beautiful and chic decorations for your home, workplace, garden, home, and so forth, you found what you are in search of. Get the desired look without hassle by the usage of our artificial succulent plants. Featuring 7 different shaped and sized faux succulents plants without pot, this colorful indoor-outdoor greenery set will bring that touch of modern style that you need. 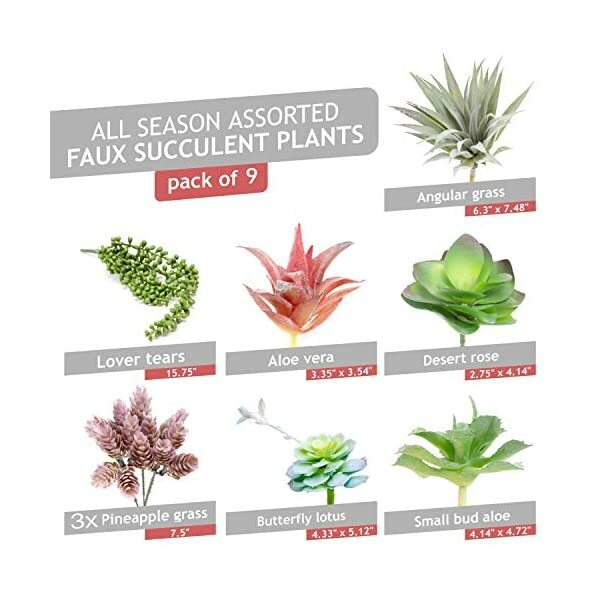 Why choose the NATAMZ unpotted fake succulent kit? 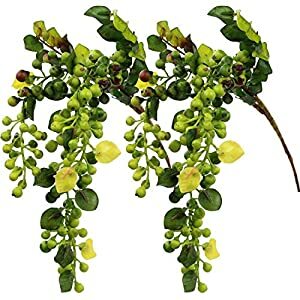 Many the usage of possibilities: With an elegant feeling and a natural looking this unique greenery kit makes a great addition to any home decor, dining table centerpieces, dream gardens, wedding decoration, bridal bouquets and more. Real looking design: Each fake succulent plant is made from premium materials, having vivid colors and a soft texture, imitating perfectly the appearance of the real ones. Easy to take care of and use: With no need to worry about watering them or keeping them in sunlight, these faux cactus plants can also be placed anywhere you need. 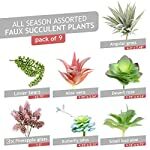 Pet and child secure: Our assorted succulent pack is made of non-toxic materials, which do not discharge any harmful chemicals in the air. In this way, it can’t harm your pets or kids and is an excellent choice for people with allergies. Lasts for a lifetime: These unpotted cacti are made of fade-resistant plastic, keeping their life-like appearance in any conditions. 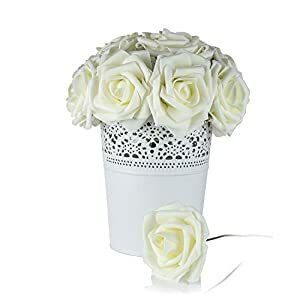 A thoughtful gift: Packed in an elegant package, these faux flowers are a great gift for your friends and family, birthdays, weddings, mother’s day, Christmas gifts and so forth. 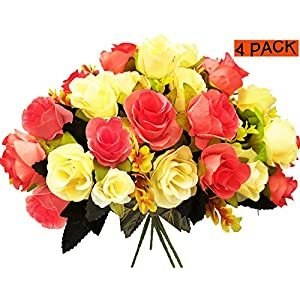 We made sure that these artificial flowers meet the higher standard in quality, but if you change your mind, for any reason, you’ll get a full refund. Ready to experience the difference? Click ‘ADD TO CART’ to order your unpotted faux succulent mix kit! 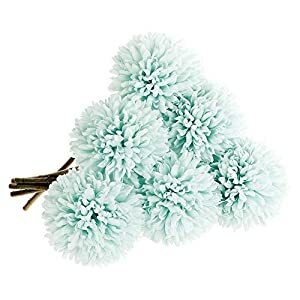 ALL SEASON FRESH DECORATIONS: Containing 7 different type of flowers with 3 pcs X Pineapple Grass totaling a variety of 9 unpotted succulent plants, with sizes between 2.7″ and 15.7″, this faux greenery set is the easiest choice for creating the most amazing decorations, adding a touch of tropical feeling. You’ll use this succulent flowers individually or together for filling a medium size pot. 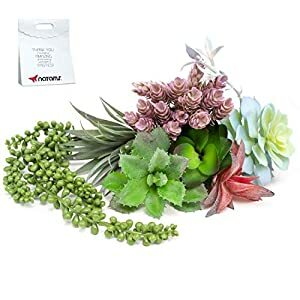 HIGH-QUALITY REALISTIC LOOKING: This assortment of succulents is made only from the highest quality plastic and some with flocking coating, with a purpose to give them the most realistic look imaginable. 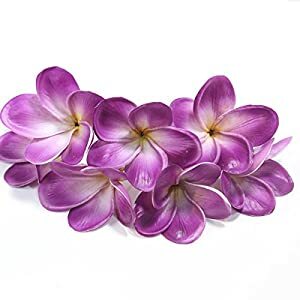 Each artificial plant has natural vivid colors, they’re much lighter than real ones, maintaining their appearance for a longer time, offering you the possibility to enjoy fresh flowers during the whole year. EASY, STRESS-FREE MAINTENANCE: If you do not want to care for constantly having to handle real plants, these faux fake succulents are ideal for you. 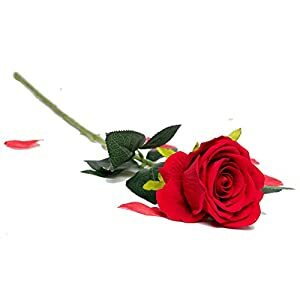 There is not any wish to ask your friends or neighbors to water them even as you are away, You’ll fully enjoy your vacation because, in spite of everything, you’ll find the artificial plants in the same condition as when you left. 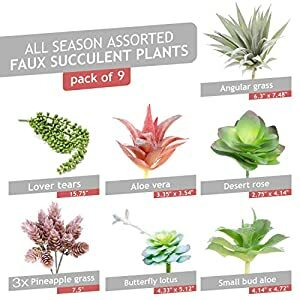 SAFE TO USE FOR EVERYONE: Our unpotted faux succulent cactus plants are made out of premium quality non-toxic materials, so they are able to not cause any harm to you, your kids, your friends and even to the one you love pets. 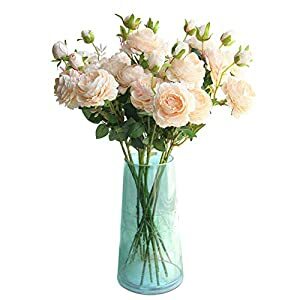 Omit about allergies or health problems, because the NATAMZ fake greenery bundle is the ultimate mess-free and safest solution for creating stunning arrangements.